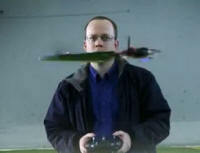 Lockheed Martin engineers are developing a UAV (Unmanned Arial Vehicle) that flies like a maple seed. Bill Borgia, head of the company's Intelligent Robotics Lab, explains that the project is part of its work on DARPA’s Nano Air Vehicle project. One really cool feature is its onboard video camera that, with the help of software, produces a stable picture that appears to be fixed (non-rotating). Per the designers, the advantage of this platform is compact size and low cost, which can make them expendable. Operation is a bit clumsy right now, but no doubt with improved software and sensors they will eventually be useful. There was a free flight model called the Charybdis that appeared in the October 1972 edition of American Aircraft Modeler.